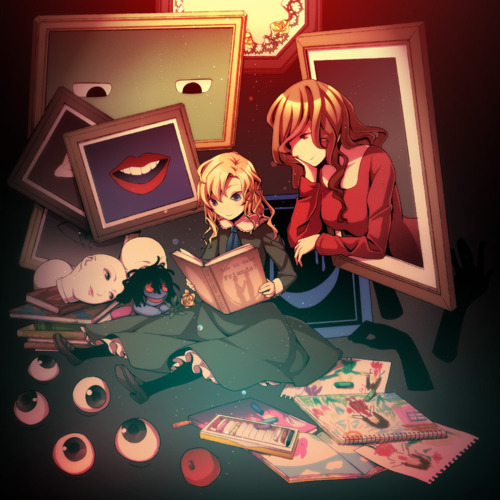 Ib, the RPG Maker horror game, has just released its latest and final version. It’s completely free and I would strongly recommend you go play it if you’re looking for new, interesting, or just flat out weird horror games. Ib (pronounced ‘eeb’) is about a girl who gets separated from her parents inside a museum, and discovers that museum is set upon killing her. The plot may sound cliched, but Ib genuinely scared me. There’s something about the very simplistic graphics that give a very surreal sense of horror to the game. You almost feel like it doesn’t make any sense for everything to be so bizarre in this world, since the graphics are so, well, old. Combine this with a very good sound design (and thank you gods that be for designers who know the power of silence in a horror game!) and creepy plot and you’ve got a recipe for the best freeware horror game I’ve seen since Yume Nikki.